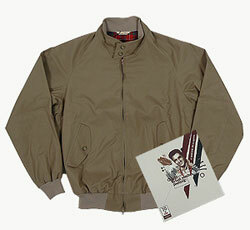 Baracuta have some limited edition 70th Anniversary G9 Harrington jackets available – each with a connection to an icon famously pictured wearing one. Those icons are Steve McQueen, Frank Sinatra and the one picture here – Elvis Presley. Each jacket contains a quote of said person printed onto the tartan of the jacket and each is incredibly limited – just 70 of each available worldwide. Sold in a presentation box and surely a collectable of the future, you can pick one up online for £145.